All right. I can accept that I am coming monumentally late to the party with this one. And I have no excuses for myself. Plenty of you sang its praises, and that many award stickers plastered all over a cover generally indicate there is something of value inside. To say nothing of that ridiculously gorgeous cover declaring to all and sundry that herein lie beautiful things. Basically, everything pointed to win and I just failed to pick up on the signals. 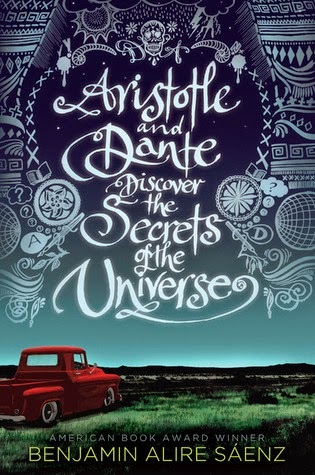 To the degree that I didn't even really know what Aristotle and Dante Discover the Secrets of the Universe was about. At all. Fast forward a couple of years to the present day when I run across Forever Young Adult's review and finally have my ah-ha moment. I ran to my local library, snagged their lovely copy, and took it home with me to see how these fancifully-monikered boys and I would get on. Spoilers: SPLENDIDLY. I had all kinds of tragic reasons for feeling sorry for myself. Being fifteen didn't help. Sometimes I thought that being fifteen was the worst tragedy of all. Aristotle narrates his life about as bluntly and intimately as an aggressively lackadaisical fifteen-year-old boy can. At least until that patently private boy meets one Dante Quintana and sees just how open and welcoming a boy (and his family) can be. It's the summer of 1985 and Ari spends most of each day struggling to find reasons to leave the house, ways to occupy himself aside from brooding about his father who seems to have dealt with his experiences in Vietnam by adopting a policy of silence. When he meanders over to the pool one day, Ari meets a boy with a squeaky voice and the kindred name of Dante who offers to teach him how to swim. Ari begrudgingly accepts. From that point on, a friendship develops that takes both boys by surprise and bids good to change their lives permanently. Accompanying them on this journey are their parents who love them unreservedly but who have their own struggles as they deal with their individual histories and the ways in which they reach into the present to shape their sons' lives as well as their own. Benjamin Alire Sáenz had me at Richie Valens. He had me somewhere amid the opening lines, at Ari going to bed wishing the world would be different when he woke up and then waking up to wonder what went through Richie Valens' head before the plane crashed. He had me at, "Hey, Buddy! The music's over." This book crushed me, it's that beautiful. I began it one night after tucking my kids into bed and—a few dozen pages later—blithely accepted the fact that I would be staying up however long it took to read it through to completion. The novel is told entirely from Ari's perspective, and it's difficult for me to tell you how much I grew to care for that boy. In simple and occasionally halting terms, he ruminates on his unease around other boys, his admiration for his mother, his longing to broach the subject of his imprisoned brother. The folding of lively, loquacious Dante into his life happens almost without Ari or the reader noticing, it is that seamless and that natural. Having some experience with friends coming into my life unexpectedly and yet at precisely the moment I so needed them to, my heart lodged itself firmly between these two boys and informed me it would be going nowhere. Since we mostly get our impressions of Dante through Ari's eyes, I occasionally worried a bit (perhaps taking my cues from Ari's deep seated anxiety) that he would flit away too soon. Before Ari or I had parsed out how to make room in our lives for such a bright star. Loving Dante is a foregone conclusion, with his inability to wear shoes, his love of reading, and his complicated relationship with his Mexican heritage. "What am I supposed to do?" I knew my voice was cracking. But I refused to cry. What was there to cry about? "I don't know what to do." I looked at Mrs. Quintana and I looked at Sam. "Dante's my friend." I wanted to tell them that I'd never had a friend, not ever, not a real one. Until Dante. I wanted to tell them that I never knew that people like Dante existed in the world, people who looked at the stars, and knew the mysteries of water, and knew enough to know that birds belonged to the heavens and weren't meant to be shot down from their graceful flights by mean and stupid boys. I wanted to tell them that he had changed my life and that I would never be the same, not ever. And that somehow it felt like it was Dante who had saved my life and not the other way around. I wanted to tell them that he was the first human being aside from my mother who had ever made me want to talk about the things that scared me. I wanted to tell them so many things and yet I didn't have the words. So I just stupidly repeated myself. "Dante's my friend." All four of the parents are such nuanced and present characters in this story and I adored that and them. Throughout the narrative, Sáenz explores the ways in which we need our parents, in which love between a parent and child is endlessly complex and often so difficult to encompass and express in any adequate way. This complexity resonated with me so profoundly, as did basically everything about this beautiful, beautiful love story. Finest kind. The Book Smugglers - "Aristotle and Dante is the kind of book that gives me hope that the universe might be still be an ok place to live." Forever Young Adult - "Aristotle & Dante Discover the Secrets of the Universe is a gorgeously-crafted portrait of two best friends exploring their identities." Savvy Verse & Wit - " It is never forced, it is as easy as a friendship between two boys can be, but it also tackles that harder issues that we as a society continue to struggle with." Wear the Old Coat - "If you ever find yourself craving a read that’s beautifully written, one that explores friendship and love in a gorgeously understated way then this book should be your first port of call."